Thankfully, this week’s cover was representative of the internal story. Its been a major gripe of mine in the previous issues, so this was a bit of a break from that big disappointment. Still, the composition is a bit weird. I’m not sure if that’s Cyborg coming out of Grid’s body or whether he is just squatting down with his new body. The story starts off by showing us a glimpse of two Doom Patrol members, Scorch and Karma. There is a long and involved melancholic discussion between the two as they talk about their experiences with peoples’ prejudices and their place in this new world which is dominated by the Crime Syndicate and their supervillain allies. And the two then end up getting attacked by Johnny Quick and Atomica. No guesses as to what happens next. Frankly, I’m disappointed. Finally, after all this time, we get to see a glimpse of the Doom Patrol and it all comes down to nothing. I really dislike how easy these two villains have had in Forever Evil. First they totally took out the Teen Titans, and now they’ve taken out the Doom Patrol as well. I kind of feel like punching the both of them, or something. 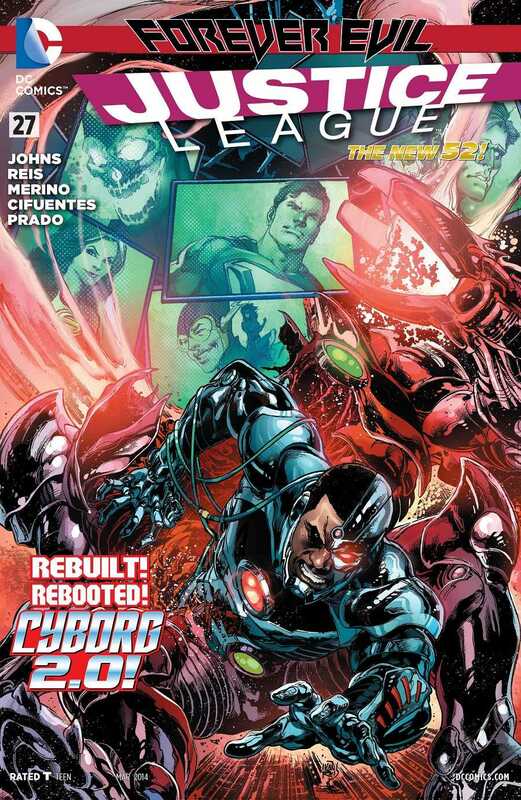 Once that’s over, we switch to Cyborg as he pleads with his father and Dr. Morrow to rebuild him. They refuse at first but then agree, in a somewhat predictable fashion that is nevertheless executed well. This entire sequence really exposes the core of Cyborg’s character and it also marks his inevitable reconciliation with his father. So that was nice. I would have liked to see more of the drama but needs must so we quickly switch to see how the two scientists rebuild his body by using bits and pieces of all the alien tech kept in the Red Room of their facility, and some good tidbits can be spotted here, possibly plot points to come later once the event is done. And once Cyborg is rebuilt, he goes off to find a certain man named Will Magnus to seek his help against Grid. It kind of felt like the issue was over pretty quick. The Doom Patrol scenes are brief and while Cyborg’s scenes are expository with the dialogue, they are nevertheless fast-paced as well. There wasn’t any real action in it either, which I kind of welcomed, but didn’t like either. Most of all, I’m disappointed that we didn’t see Sinestro really going up against Power Ring, as was shown on the cover for the previous issue. Now I’m thinking that that will be covered in Forever Evil #5. And so that seems to be the waste of a perfectly good cover. On the art side, Ivan Reis did the layouts while Joe Prado, Jesus Merino and Vicente Cifuentes did the finishes. Rod Reis was back as the colourist and Dezi Sienty was still on the letters. As always, this is a great art team and I don’t really have any criticisms. Cyborg 2.0 looks really great, now that he’s slimmed down and become quite sleek overall, getting rid of all the bulk. As he says to his father before he is rebuilt, he doesn’t want to look like a tank anymore, and he wants certain upgrades. Overall, a better issue than the last time, but there is still a lot of room for improvement. More Justice League: #1-6, #7-12, #13-15, #22-23, #23.1, #23.2, #23.4, #24, #25, #26. Posted on January 24, 2014, in Comics Reviews, Review Central and tagged Atomica, Comics, Comics Review, Crime Syndicate, Crime Syndicate of America, Cyborg, Dezi Sienty, Doom Patrol, Earth 3, Evil, Forever Evil, Geoff Johns, Grid, Ivan Reis, Joe Prado, Johnny Quick, Justice League, Metal Men, New 52, Review, Review Central, Rod Reis, Science Fiction, Superheroes, Supervillains, Vicente Cifuentes, Will Magnus. Bookmark the permalink. 8 Comments. I agree, I am ready for the Forever Evil series to be over and to get back to the original series storylines. It doesn’t help that there are so many FE books that don’t really have a whole lot to do with each other. And FE itself has been really slow. Marvel did a much better thing with Infinity, and I think that’s what DC should have done. Wrap up the FE arc in 4 months or something, instead of seven long months.